This is one of my daughter's favourite snacks. I found this recipe to replace the pastizzi I used to buy in the shops. The ricotta and spinach filling is lovely, not rubbery like shop filling is. 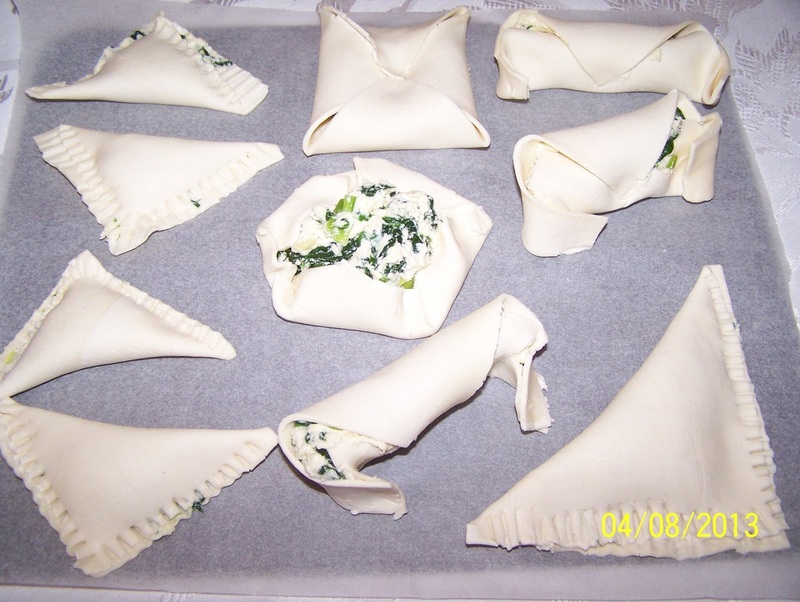 Originally the recipe is for the ones pictured on the bottom row, the one that shows the ricotta and spinach filling the most. They are made larger normally, and is great as a lunch idea. But my daughter likes making different styles and I now like to make them smaller, party size. We have made square parcel shapes, little gifts, scored squares, triangles and croissant shapes. How you design them is up to you, any way you make them, they are delicious. 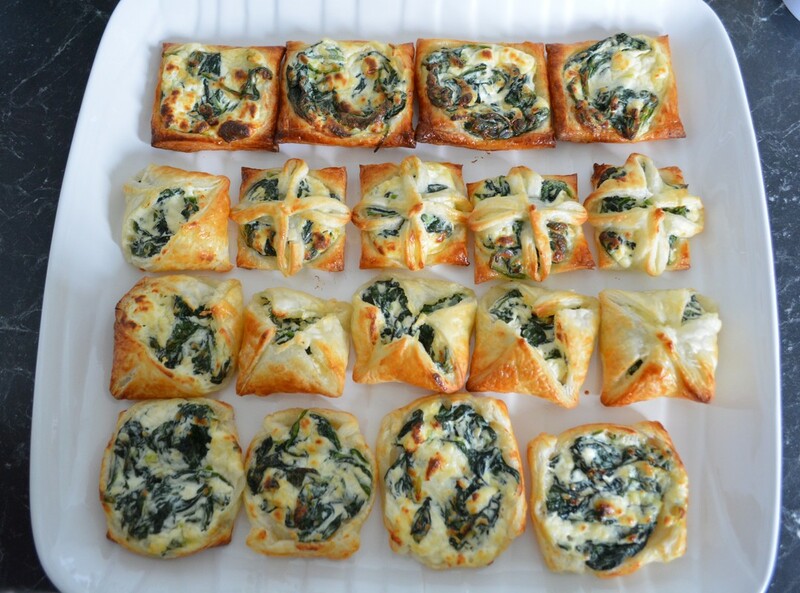 What is great about these is that you can make them, then freeze them for later use. Just pull out of the freezer and bake frozen until golden brown. Usually the little triangles I make for parties, freeze them, then bake them when needed. You can add some feta to the mix if you like, or some nutmeg, I've provided the basic recipe, add more or less spinach, whatever you prefer. 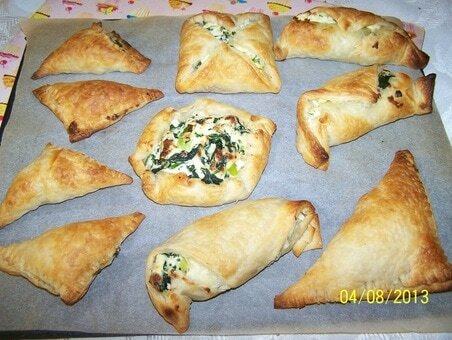 You can also use filo pastry to make triangles, or large coils, instead of using the puff pastry. Boil, steam or microwave the spinach until tender, drain. Squeeze out excess liquid. Cool. Heat oil in a small frying pan, add spring onions and garlic; cook, stirring, until spring onions are soft. Cool. Preheat oven to a very hot 240C/220C fan forced. Combine spring onion mixture with spinach, dill, ricotta, parmesan and egg in a bowl; mix well. Season with salt and pepper. Cut pastry sheets into quarters. Place pastry squares onto baking paper lined oven trays. 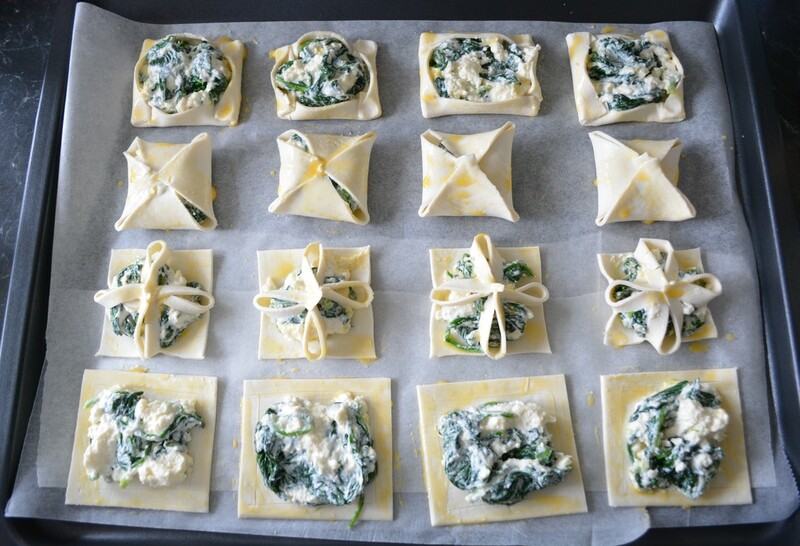 Divide spinach mixture evenly among pastry squares, leaving a 2cm border. Fold the edges roughly over the filling, but leaving the filling exposed. Cook in the preheated oven for about 15 minutes, or until pastry is lightly browned and filling is set. Serve warm.